A few weeks ago we moved the woodburning stove in our front room out from its hole in the wall (where all the heat seemed to get absorbed by the wall) into the room proper. and it is so much better! It is deliciously warm now, I am only sad that I have to come into the other room to use the computer (oh how i wish for a laptop!). 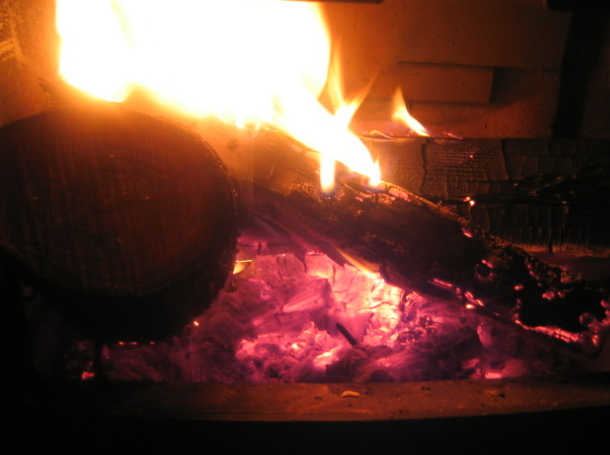 Anyway the fire is good, because the rain and gales here have calmed a little but it is getting colder, like it should be really at this time of year. proper winter weather please! We have been making paper snowflakes to decorate the windows, last year we cut our own designs, but this year we have also been enjoying patterns from the childrens advent calendar sent by their Granny. I think she got them from this site. I noticed earlier today there are also some on Martha Stewart (found via Kiddley). Last night my friend Julia also told me about this snowflake site that she had just discovered where you can design snowflakes then save them and animate them to all fall together. it is absolutely brilliant fun and very addictive, I think the kids might enjoy it too, though it might be a bit tricky for little ones. And I still havent got my tree, but when I popped into the shop earlier they assured me they will be arriving tomorrow!! Looking forward to seeing the snowflakes up. The sites you recommend are fab?